If you missed our last broadcast (September 29) you can find the free archive right here. On this show we feature brand new music from the Margraves, the Hula Girls, and Rocket J.; an incredible, never-before-broadcast home recording by the Hell Divers; news from last weekend's New England Shake-Up and the upcoming Ponderosa Stomp--stellar events, both; and new 45s acquired in recent travels--plus lots of classic rockabilly, hillbilly, R&B, and rock 'n' roll. As always, we greatly appreciate your listenership. If you like the show, let us know! You can send messages and requests to our Facebook page. We'll be back with a new show in two weeks. Thanks! Jerry Lee Lewis “Drinkin' Wine Spodee-O-Dee” from Ferriday Fireball on Charly — Sun Records 1959 (?). Originally unissued. 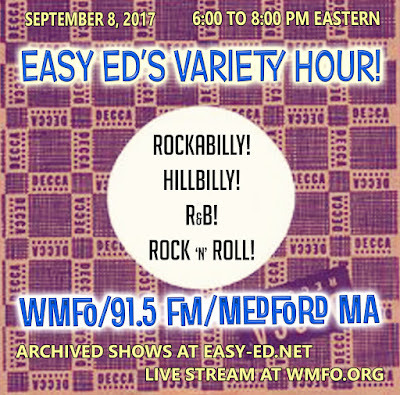 Easy Ed's Variety Hour Sept. 8 + Primitive Sounds Sept. 20 + The New England Shake-Up! 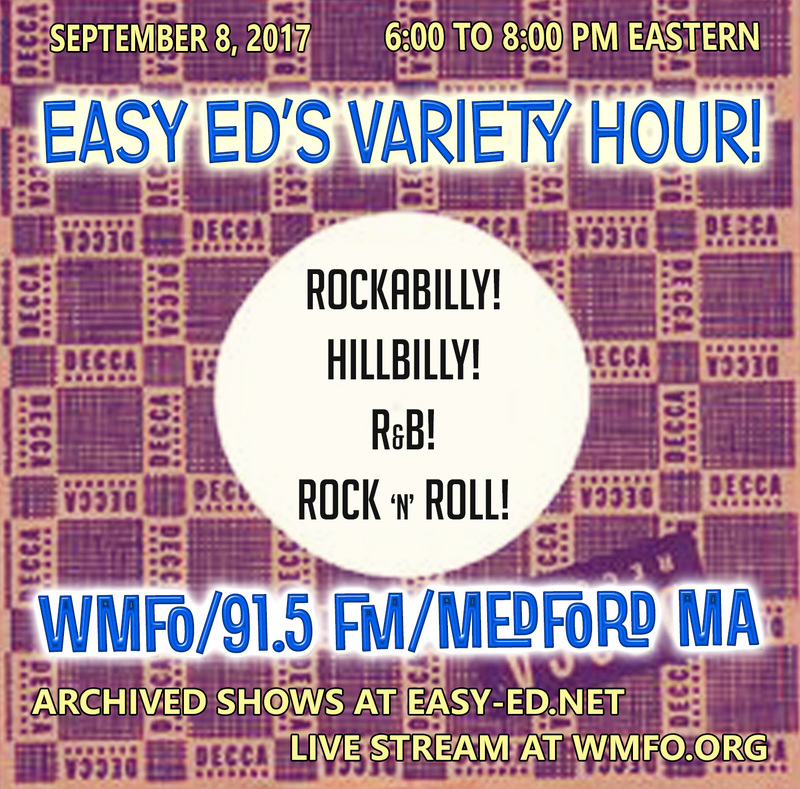 If you missed the September 9 broadcast you can find the always-free archive MP3 right here. 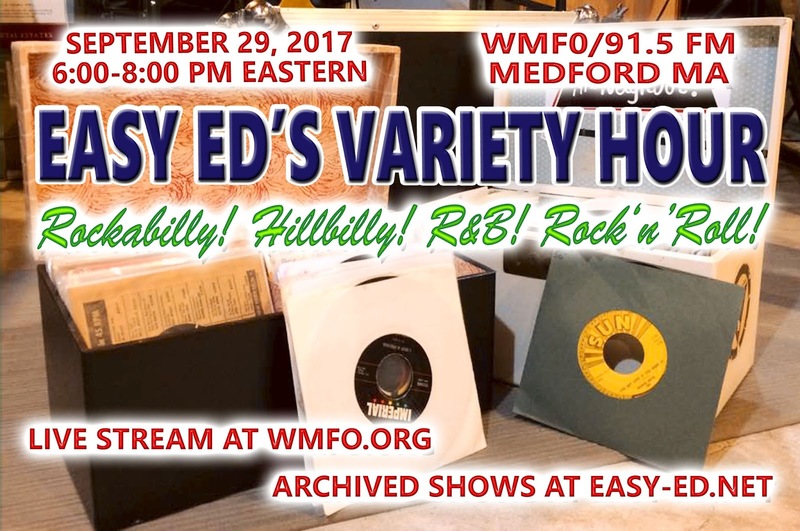 This episode features selections by Benny Joy, Warren Smith, Vince and the Sun Boppers, Big Sandy and His Fly-Rite Boys, The Lucky Stars, Nolan Strong and the Diablos; a brand new release by The Retrobaits; and a preview of bands coming our way next week for The New England Shake-Up. The list of songs we played this time out appears at the bottom of this post. Read on, tune in, and dig in! Local folks, you have two chances to see Big Sandy next week--at the Shake-Up (Saturday night) and at the Lizard Lounge in Cambridge on September 19. Early (8:00 PM) start. No cover! Brass Union has an excellent sound system, dance floor, table games, extensive beer and cocktail selection, and great food. See you there! 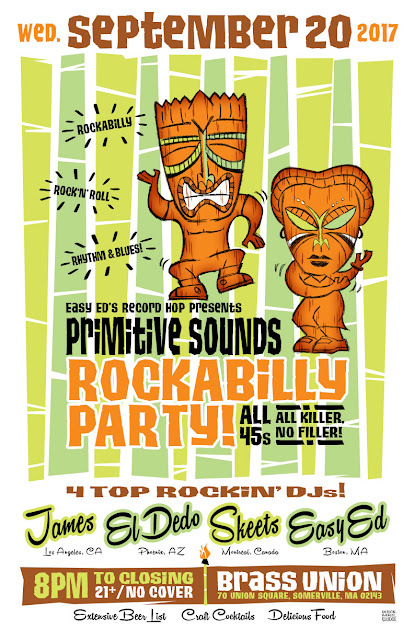 Event flier by Mrs. Sludge. 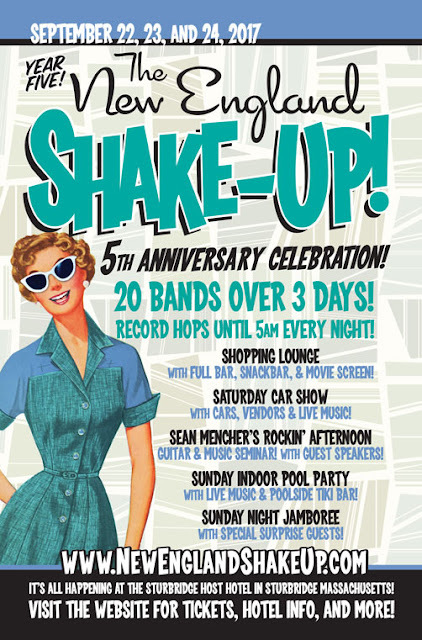 The New England Shake-Up (September 22-24 in Sturbridge, MA) is almost here! Year five's band lineup features Sweden's Go Getters, The Barnshakers (Finland), Big Sandy and His Fly-Rite Boys, The Lucky Stars, Furious, Rockin' Lloyd Tripp,The Starjays, Lil' Mo and The Unholy 4, The 24th Street Wailers, and lots, lots more. A car show, dance classes, and fantastic DJs spinning records all weekend long. 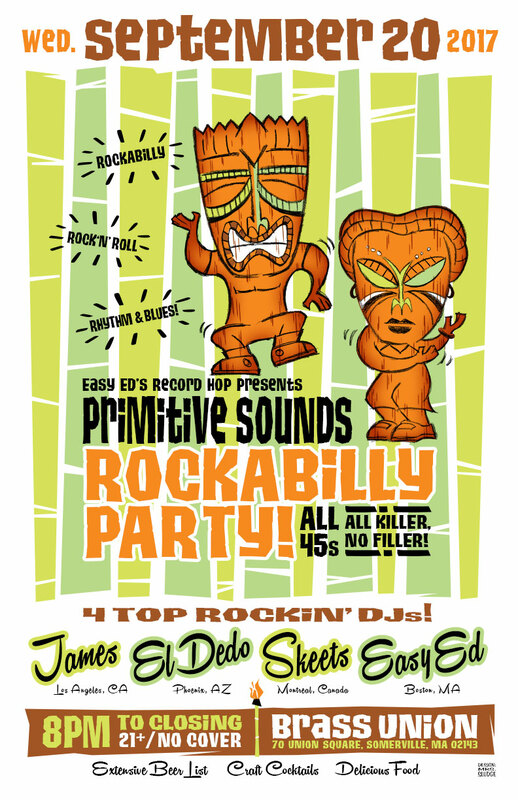 Easy Ed's Record Hop is excited to be on the bill for the fifth time. Big Sandy and His Fly-Rite Boys “Draggen-it Boogie” from On the Go on No Hit Records — See him at the New England Shake-Up 9/22-9/24! The Lucky Stars “Whose Hat Is That?” from Go to Town on Fate Records — See them Sept. 22-24 at the New England Shake-Up in Sturbridge, MA. The Barnshakers “Boppin' in Roswell” from Five Minutes To Live on Goofin — See them Sept. 22-24 at the New England Shake-Up in Sturbridge, MA. The Go Getters “Somebody's Been Rockin' My Boat” from Real Gone on Part Records — See them Sept. 22-24 at the New England Shake-Up in Sturbridge, MA. 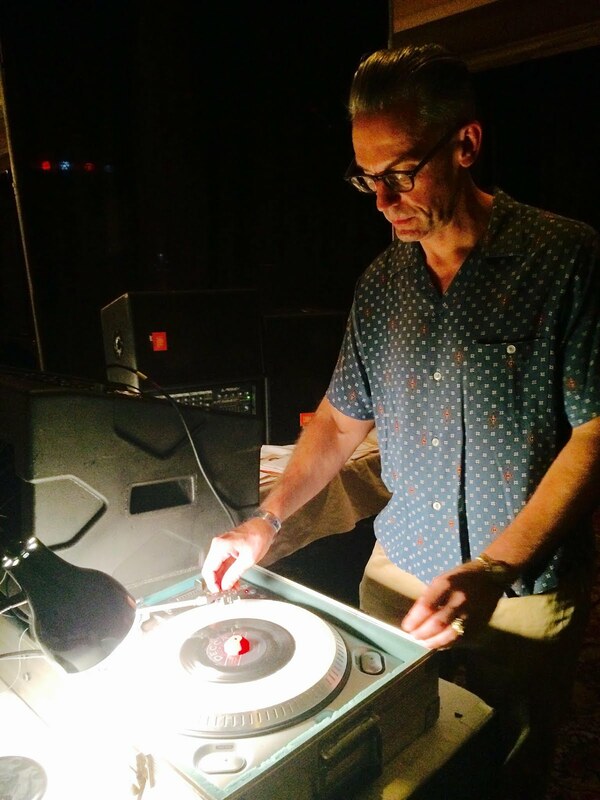 The 24th Street Wailers “Can't Fight It” from Where Evil Grows on Lmb Records — See them Sept. 22-24 at the New England Shake-Up in Sturbridge, MA.